It is time to get those fruitcakes going! And so I have gone looking for them on Martha Stewart's web site. This is a job for Martha Stewart. You cannot go looking for fruitcakes in Cooking Light magazine or any other place devoted to healthy eating. Plus Cooking Light gets a little skewed when it comes to desserts. They are obsessed by cutting fat so do that they amp up the sugar. End result, as we say here in Buffalo: You must go to Martha. I was drawn to "Moist and Boozy Fruitcake With Rum and Port." Just the ingredient list for any fruitcake makes you dizzy. A pound of raisins, a pound of dried currants, a pound of dried cherries, a pound of butter, a pound of, ahem, dried plums ... and I am not even getting into the nuts or the citrus peel or anything. I must needs by oranges and grapefruit so I can candy my own peel. I did that once before and it is easy and cheap and better than if you bought it prepared. The above picture comes off the Internet and it underestimates the things you will need. By the way what is with the Welch's grape juice? Who posted this picture, some Southern Baptist? Grape juice is not going to preserve your fruitcake. You need that booze. 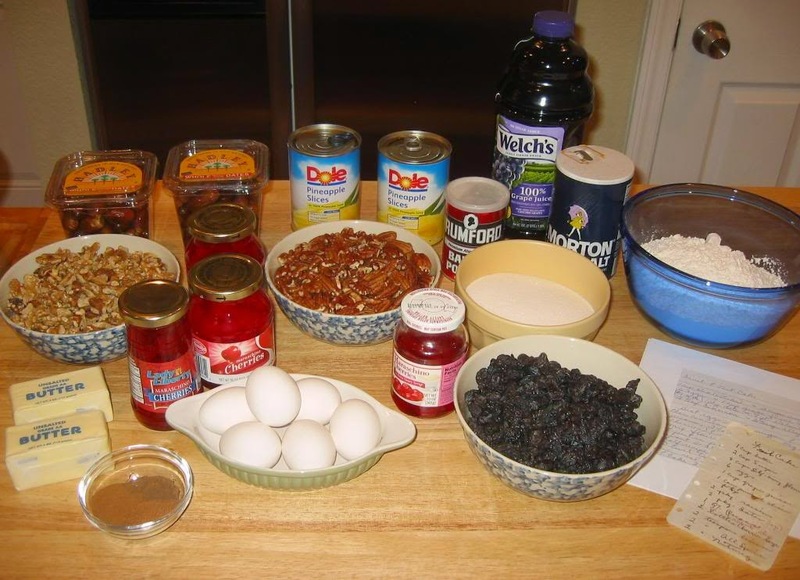 When I did fruitcakes before it was really fun. As I wrote before that was pre-Leonard Pennario when I had all the time in the world. Now I have no time. But you do have to spend an hour or so a day cooking and I can wedge my fruitcake project into that. Homemade fruitcakes are really delicious and lighter than that stuff you buy that it is like a brick. Imagine a wonderful rum cake. That is what they are like. At least I have the rum. Stir-Up Sunday is past, but today can be Stir-Up Monday!